In another post we went over Sun Salutation A and why it's a great starting point in any yoga practice. I closed it out by saying that moving from Sun Salutation A into Sun Salutation B was an easy and natural progression. Both of these sequences are an amazing tool to build your yoga practice and to help build strength and stamina for longer yoga classes or yoga flows. There isn't a right or wrong answer for how long you should practice these two sequences before moving on to anything else. Mostly, it's about your comfort level. Some people enjoy knowing what they're going to practice each day they get on their mat, and some people crave the creativity of just flowing and moving. What Should You Do After Sun Salutation B? If you have practiced Sun Salutation A you'll notice that you don't really rest between poses unless you're in Downward Facing Dog. Well, the same thing applies to this sequence, only it's a bit longer and can seem to go a lot faster. The main thing to remember with yoga is that it's not a race and you need to breathe. If you're not used to breathing with the movements in your yoga practice or if you're used to staying in a posture for a few breaths, then this might seem hard. During your practice, if you start to feel winded come down into Child's Pose to rest for a little bit. Catch your breath and slow your breathing. You should be able to move through the sequence without your breathing becoming labored or erratic. Granted, you won't start Sun Salutation B that way, but that's where you want to get to. It should flow with your breath. The salutations are a sort of moving meditation. You're focusing on your breath and your alignment in each posture. This allows you to be in tune with your body and centers your mind. Ok, so how the flip do you do this practice that may or may not speed our breathing up a good bit? I've laid it all out below and I have a graphic at the bottom that shows the progression through each of the yoga postures. Remember that if you need to take a break to come into Child's Pose to slow your breathing. Also, don't be hard on yourself. This is a practice. You will forever be a student of yoga as there is always something that we need to learn. There will be different stages in our lives when some things are harder than others and we need to learn to get through these times without getting frazzled. Yoga helps us to love ourselves as we are and to accept that there are things we can and can't do. Self-love and being kind to ourselves is necessary. Be gentle and learn along your way. To start, come to the front of your mat with your big toes touching. 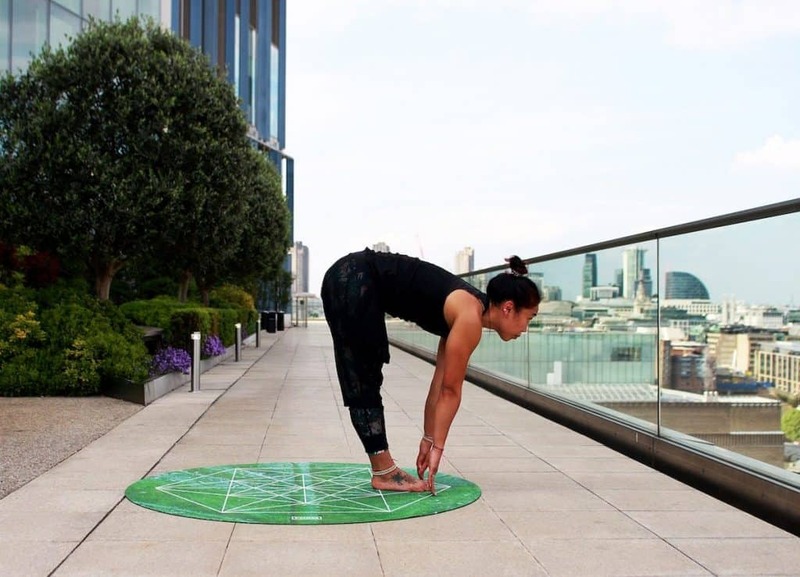 Lift your toes off the ground and feel all four corners of your feet press into the ground. Engage your leg muscles as you begin to slow your breathing and center your mind creating an intention for your practice. Arms should be at your side and shoulders drawing away from your ears. Keeping your gaze soft and forward. Remain here for 5 breaths. On an inhale reach up towards the sky and squat down into Chair Pose. Sink down with your knees squeezing together, thighs engaged, core sucked back and spine straight. Reaching your arms overhead as you gaze towards your thumbs. Remain here for your exhale. Inhale and come out of Chair Pose and exhale to fold forward into Uttanasana (Forward Fold). Keeping your spine as straight as you can as you fold forward placing your hands on the ground. If you can only get your fingers to the ground, that's ok. Keep your core engaged and drawn in and your thigh muscles activated. Remain only for as long as your exhale. Inhale and lift your back up and bring your fingertips to graze the ground. Your back should be flat and not straining. Legs should still be active and your belly should still be pulled towards your spine. If you need to place your hands on your shins to come to a flat back then do that. Only remain for your inhale. Exhale and hop or step your feet back to Plank Pose and lower down into Chaturanga Dandasana. Hands should be in line with your chest and your elbows should be drawn in at the sides. Shoulders should be drawn away from your ears and your back, core, and legs should be engaged. Come out of Chaturanga Dandasana you'll over your toes (or flip your feet over) and roll forward into Upward Facing Dog. Make sure your palms are firmly planted on the ground and lift up through your thighs. Also, keep your shoulders pulled down away from your ears to protect your neck. Keep your legs and your core engaged to build strength in this pose. From Chaturanga lift your hips towards the sky as you press back into Downward Dog. Feet should be hip distance apart. Press up through your hands and reach your hips towards the sky as you press your heels into the ground. Don't worry if your heels don't touch. Just remember to keep your back long, lift your hips and try to keep your legs somewhat straight. Stay in Downward Dog for 5 breaths before moving on. Inhale and bring your right foot forward between your hands. Turn your back foot at a 45-degree angle and lift your arms up overhead. Remember to keep your legs activated, press your feet into the ground as you stretch your arms overhead. Your core should be engaged and belly drawn toward your spine. Remain here for your inhale. Make sure your palms are firmly planted on the ground and lift up through your thighs. Rather than allowing your shoulders to creep up by your ears, try to keep them pulled down away to protect your neck. From Chaturanga lift your hips towards the sky as you press back into Downward Dog. Also, your feet should be hip distance apart. Your legs should still be active and your belly should still be pulled towards your spine. Exhale and fold forward into Uttanasana (Forward Fold). Keeping your spine as straight as you can as you fold forward placing your hands on the ground. On an inhale, come up out of your Forward Fold pose and reach up towards the sky exhale squat down into Chair Pose. Exhale your arms back down to your sides with your shoulders drawing away from your ears. Keeping your gaze soft and forward. Try to remain only as long as your exhale and then repeat Sun Salutation A 4-9 more times. 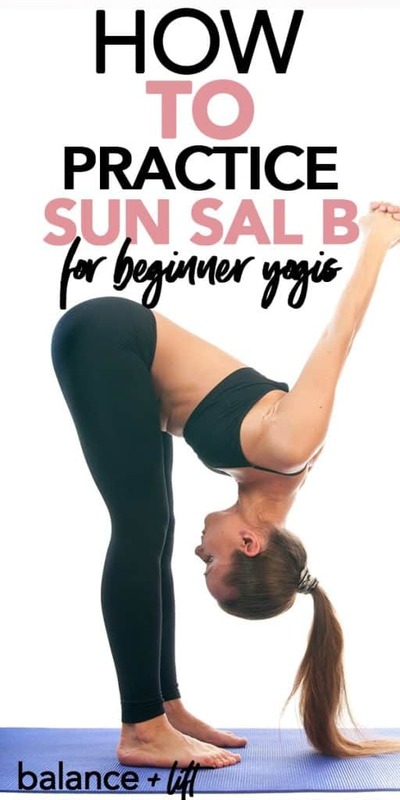 If you're starting to feel good with moving through Sun Salutation A and Sun Salutation B then it's time to start adding more to your practice. 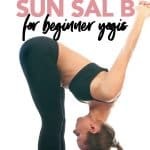 If you're looking for different types of yoga sequences that focus on different areas of your body or maybe provide a little more of a challenge then check out this post here. I wrote about some Yoga YouTube Channels that are amazing and each one has tons of videos that are great for beginners and folks looking for a challenge too.